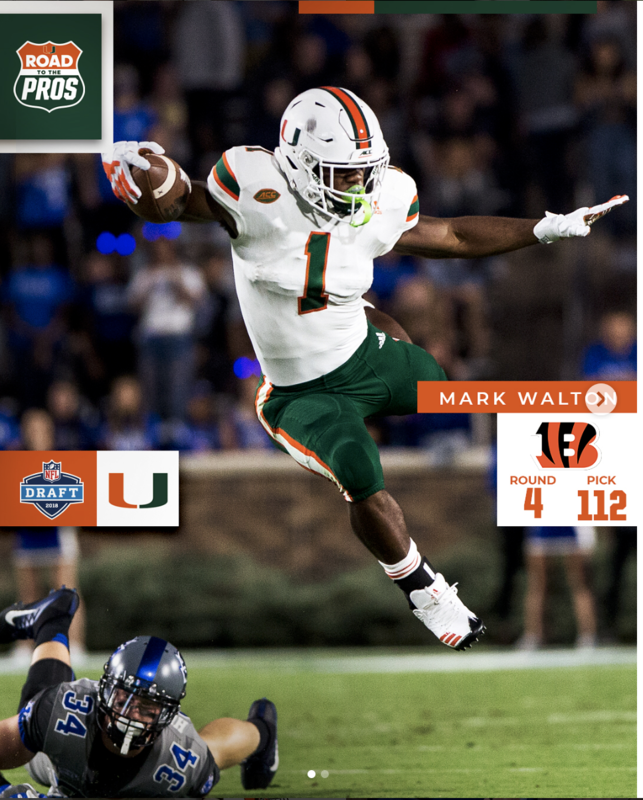 With the semester over, it’s time to catch up on everything hurricanes since football season to show off to your friends back home. 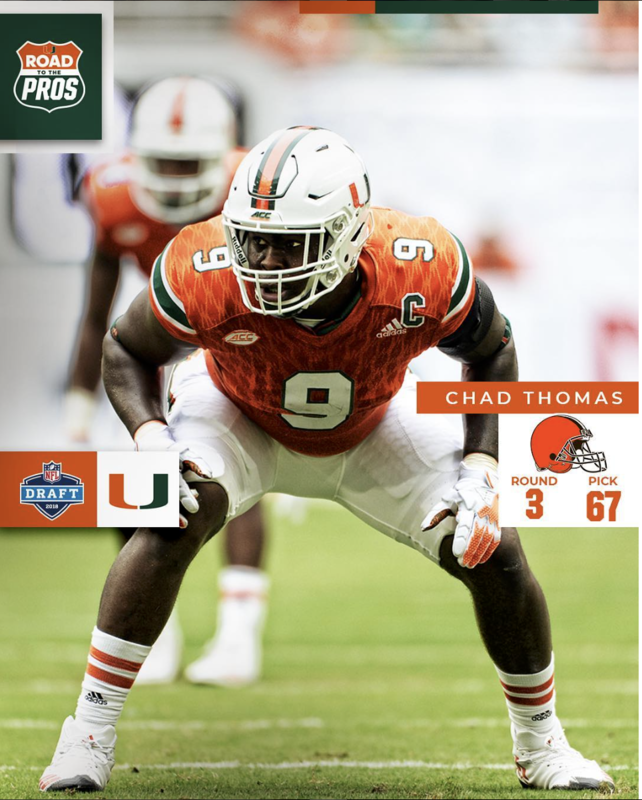 After an impressive season, the NFL Draft concluded with six Miami Hurricanes selected. Miami was tied for the 3rd most draft picks along with Georgia and Penn State. 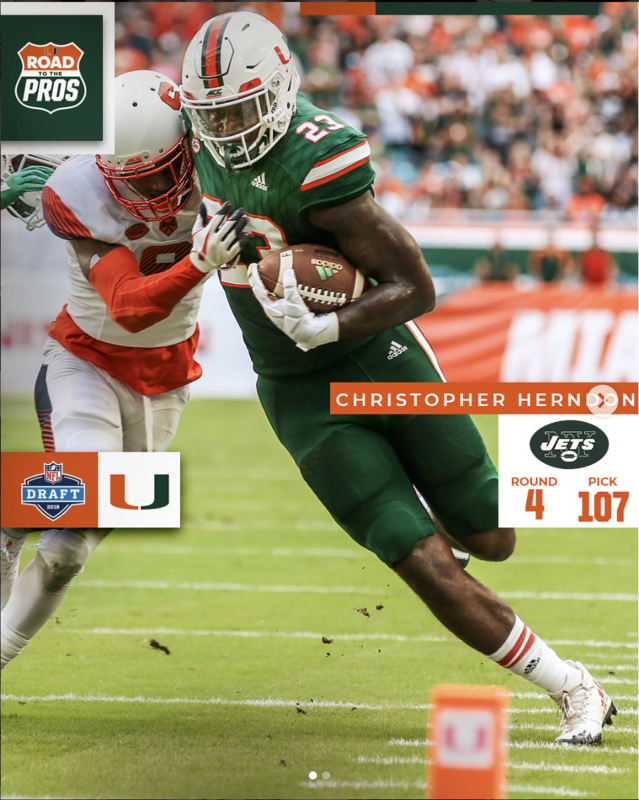 This new crop of pro Canes looks to add to the legacy of NFL with a new crop of rookies in the National Football League. Below is where each drafted player was drafted, their legacy to UM, and fit on their respected teams. Round 3 Pick 3 by the Cleveland Browns. He is an athletic and dominant edge rusher with the ability to cause havoc. Thomas was a highly regarded prospect before joining the team. He began seeing significant playing time in 2015 but had his breakout season in 2016. In 2017 Thomas 41 stops, 12.5 for loss, and 5.5 sacks. He has the potential to be a matchup nightmare and premier player in the NFL. Thomas will fit in excellent with the Browns and can see time on the field as a pass rusher this upcoming season. Round 4 Pick 7 by the New York Jets. Herndon is not only an outstanding blocker but explosive receiver as well. He played alongside 1st round pick David Njoku in 2016 leading to fewer receptions. In 2017 he was a vital cog in the offense with 40 receptions, 477 yards, and four touchdowns before an MCL injury cut his season short. Herndon will compete for a starting job immediately this season. As a Jets fan, it is an excellent fit because can be a cornerstone of the franchise and their new rookie QB Sam Darnold. Round 4, Pick 12 by the Cincinnati Bengals. Walton is a fluid back with home run hitting ability. Walton was putting up video game numbers in 2017, rushing for 428 yards and 3 touchdowns as well as seven catches for 90 yards. Unfortunately, Walton suffered an ankle injury that ended his season early. Walton can be of the similar mold of breakout running backs drafted after the first few rounds. He has a realistic chance of starting and becoming a breakout back for the Bengals. Round 5 Pick 2 by the New York Giants. 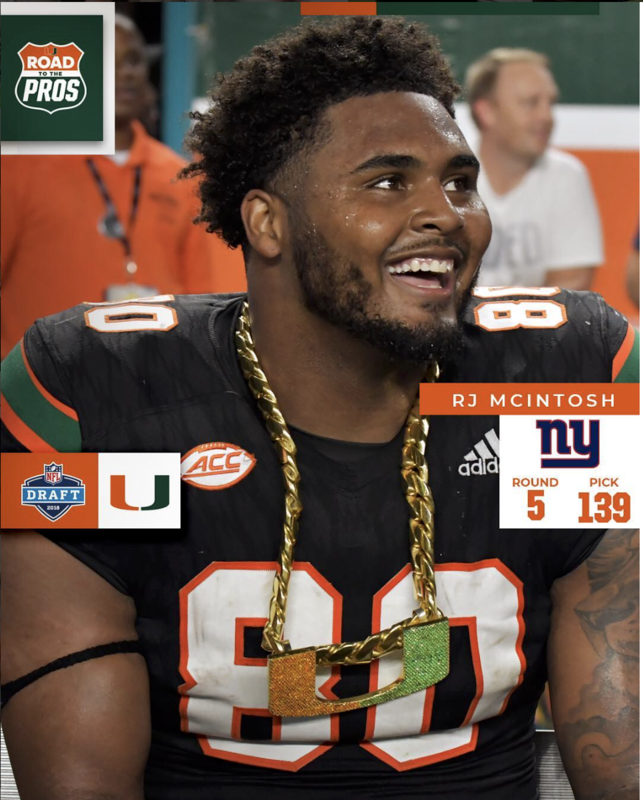 Mcintosh is a solid defensive lineman with the ability to grow in the NFL. In 2017, McIntosh recorded 52 tackles, 12.5 for a loss, as well as two sacks. He has the opportunity to be a base defensive lineman for big blue this season. Round 6 Pick 36 by the New England Patriots. Berrios is a reliable slot receiver that is an excellent returner. 2017 was a breakout year for Berrios as he had 55 receptions for 679 yards with nine touchdowns. As a returner, he had a 15.92 punt return average as well. 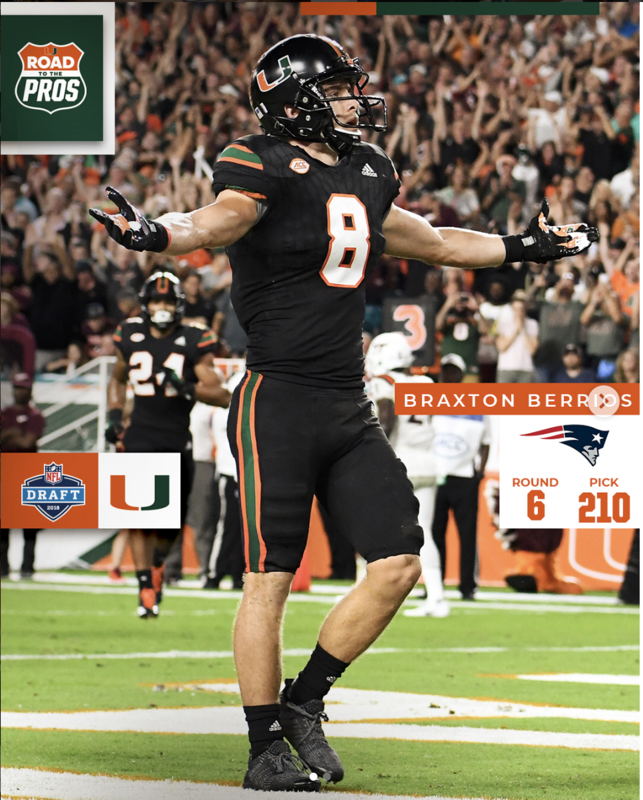 Braxton Berrios will be an ideal fit for the New England Patriots and will have a great chance of thriving under the system. He has a very realistic chance of starting this season. Round 7 Pick 24, by the Carolina Panthers. 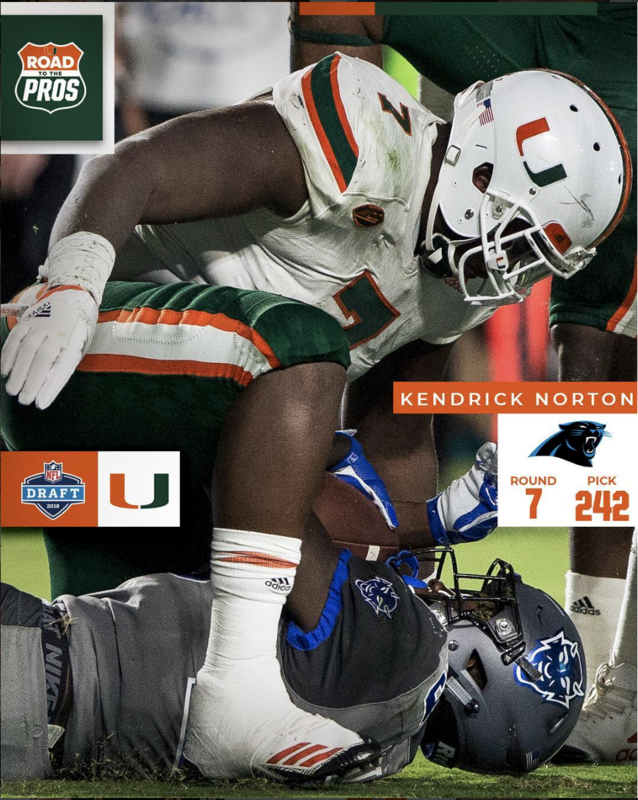 Norton was a solid defensive lineman for the Canes and provided a strong presence on the defensive line. In 2017 he contributed 26 tackles, 6.5 for a loss as well as two sacks. Norton was a steal for the Panthers in the 7th round as he should have been drafted way earlier and can see immediate playing time in 2018.